Learn the where to find Essence of a Chosen so you can upgrade your weapons to the max in Darksiders 3. 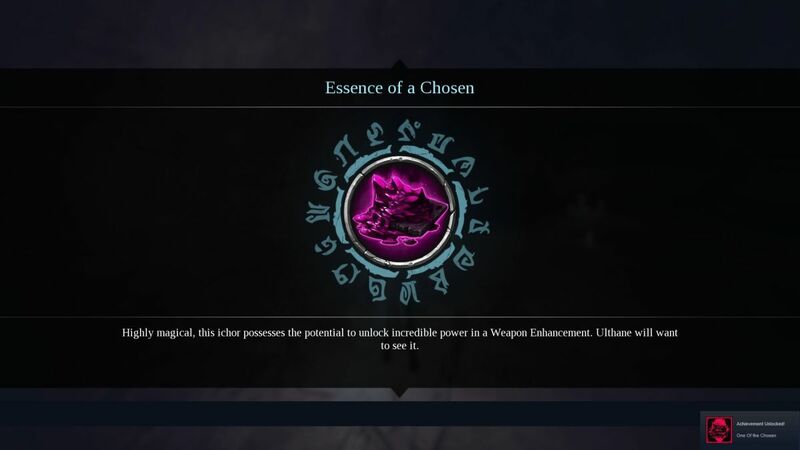 To reach the superior Balanced level when upgrading a weapon, you first need to get your hands on Essence of a Chosen. In the later stages of the game Vulgrim will sell Essence of a Chosen, but not until you’ve defeated nearly all of the Seven Deadly Sins. To get your hands some sooner, you need to defeat Chosen enemies that are tucked away in different places of Darksiders 3’s world. They’re notabley tougher than regular enemies, and even finding them will require some work and usually at least one Hollow Form. We’ve listed the location of each below along with instructions on how to reach them. 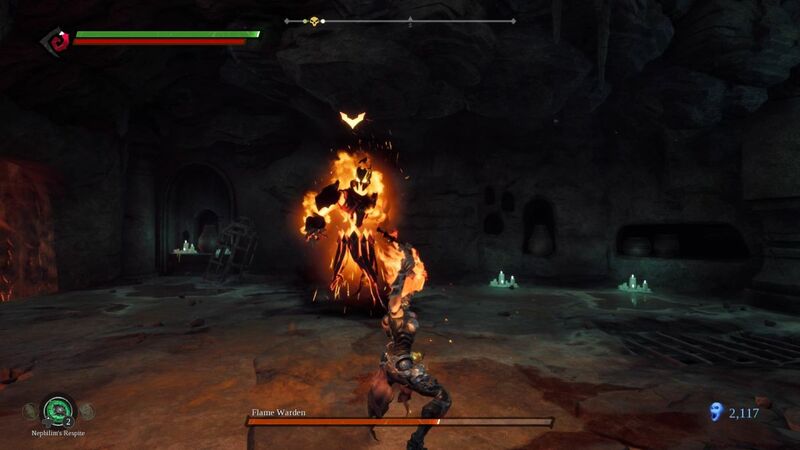 You’ll travel past Agony’s hideout early in Darksiders 3, but it won’t be until you’ve earned the Stasis and Force Hollow Forms that you can come back to beat them. Once you have the two Hollow Forms, fast travel to the West End Serpent Hole and enter the buildings nearby. You need to make your way up to the top floor by using Stasis Form in the elevator shaft found in one of the buildings. Once you’re at the top, use the Force Hollow Form to roll over the crystals and arrive at Agony. The Flame Warden is hidden in the room you’ll enter shortly before reaching Blistering Bridge. There are pots against the wall here that reveal a tunnel when smashed. Crawl through and pull the lever to open up a staircase in the previous room. Return to the main room and take the new path to reach the Flame Warden. The next Chosen enemy is in the Bonelands, close to the Cargo Ship Serpent Hole. From the travel point, run towards the poisoned region on your right. You’ll need the Storm Hollow Form here to travel through the wind tunnels. On the other side you should spot a Mansk on the building that you can hit to bring to the ground. Keep hitting it until it’s close to the walkway you see on the left, then climb up and use the Flame Hollow Form to jump up to the roof. Travel forward down the hallway to reach the Corrupted Tomekeeper. Reaching the Templar of the Damned requires going for a quick dip in the Forgotten Lake. Equip the Force Hollow Form then jump into the water near the Forgotten Lake Serpent Hole. Stick to the left you’ll reach two crystals that, when struck, open up a gate close by. Enter and swim through the hole. Once up on the ledge, use Force Hollow Form to roll up the crystals here and you’ll enter the room holding the Templar of the Damned Chosen. The final Chosen enemy can be fought in the Scar. Jump up to the rusted conveyor and swing to the platform on your left. From here, follow the bridge along the outside then drop down into the room hidden down on the left. You’ll find The Grock inside. With plenty of Essence of a Chosen stored up you’ll be able to upgrade your weapons as desired to reach the optimal Balanced state. Be sure to check out the other Darksiders 3 guides here are AllGamers to keep Fury fighting fit! We can even teach you the voice cast for all your favorite characters in the game.